This page lists some useful tools for investigating networks. Note that I avoid Windows as much as possible, so I'm more likely to get that wrong, or just be out-of-date. But, if you'd like your own, both Linux and the various BSD Unix distributions are available free. There are many choices. I like Fedora, but the Ubuntu Linux seems the most popular for workstations. It is possible to install Linux along with an existing Window system. One of the easiest ways is to install on a USB flash drive, which avoids having to repartition the main hard drive. To find out what Internet address(es) your machine is using, you can use the ipconfig command on Windows, or ifconfig on Unix. In either case, you will learn the IP address(s) of the various network connections (“intefaces”) on your machine. My desktop has an Ethernet connection with an IP (the second interface, enp0s25), and the loop-back device lo. That later isn't a physical device, but just part of the OS that lets you send messages to yourself. Useful for testing. Depending on your Linux distro, you may have to type the full name: /sbin/ifconfig instead of just ifconfig. This machine has an ethernet adaptor, which is given. The others, like loopback in the Linux list, are software objects, not real physical network interfaces. Windows created these unbidden; they appear to be related to network tunneling. The Linux one is a lot longer, in large part because it includes the Unix connections, which are not actually network connections at all, but are connections between programs on the same machine. [bennet@sandbox ~]$ netstat Active Internet connections (w/o servers) Proto Recv-Q Send-Q Local Address Foreign Address State tcp 0 0 sandbox.mc.edu:ssh bennet.mc.edu:51586 ESTABLISHED udp 0 0 localhost.localdomain:36643 localhost.localdomain:36643 ESTABLISHED Active UNIX domain sockets (w/o servers) Proto RefCnt Flags Type State I-Node Path unix 9 [ ] DGRAM 5331752 /dev/log unix 2 [ ] DGRAM 6122578 @/com/ubuntu/upstart . . . The most basic testing tool sees if a message will reach another host, and if its reply will return. If successful, it also measures the round-trip time. This program will discover the route to another host on the Internet. The three times after each name are three measurements of the round-trip time to the listed router. Windows insists on calling it tracert, and its output has similar contents with nicer formatting. All the above tools are simple. This one isn't, and it's very powerful, and it's a GUI program. Wireshark is a network sniffer which will list whatever traffic it sees on an attached network, possibly including traffic that's none of your business. It displays all the control information used by the underlying network protocol so you can see its operation. On Linux, it's not usually part of a default install, but will be available under add software. For Windows, go here. A useful companion is the text version of wireshark, called tshark. [bennet@m-mcc-csc-01456 web2]$ tshark -i enp0s25 Capturing on 'enp0s25' 1 0.000000 10.27.2.212 -> 204.79.197.200 TCP 66 33816→443 [FIN, ACK] Seq=1 Ack=1 Win=1942 Len=0 TSval=4101471232 TSecr=796088288 2 0.257035 10.27.2.212 -> 73.251.28.254 OpenVPN 95 MessageType: P_DATA_V1 3 0.319994 10.27.2.212 -> 112.85.42.24 TCP 66 22→44437 [FIN, ACK] Seq=1 Ack=1 Win=247 Len=0 TSval=4101471552 TSecr=7525997 4 0.423880 10.27.2.212 -> 216.58.194.142 HTTP 356 HEAD /edgedl/release2/aqasjqqhk683ew8txtf145oecq1f6r13t8i0u728d3hwfy8qp9jjirctfw1irsytj9lp2cbhi8wm28kmh9gkz6693qjtwa7ptsu/15.86.0_win_SoftwareReporter.crx HTTP/1.1 5 0.424592 216.58.194.142 -> 10.27.2.212 TCP 66 80→44532 [ACK] Seq=1 Ack=291 Win=8576 Len=0 TSval=770004553 TSecr=4101471655 . . . This program prints trace to the standard output stream, which makes it easy to capture and analyze with text-based tools and scripts. 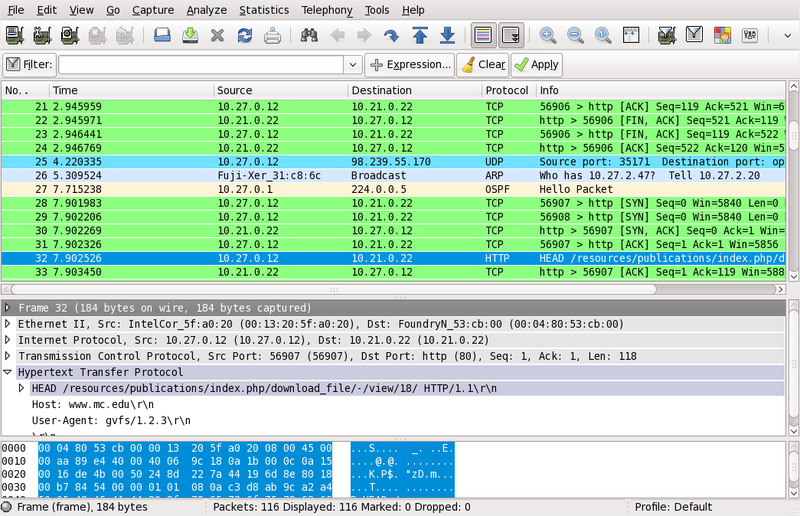 It is often prefable to Wireshark when looking for something specific, rather than just trying to get a picture of what's going on. It has a large number of options to control exactly what information is printed. Whether or not something is a tradesman's tool or burglar's equipment often depends on whether it is being carried by a locksmith or a thief. The Network Mapper can certainly fall in either category. Its purpose is to determine what computers are attached to a network, what services they are provide and what OS is running on them. The network administrator can use it to test the effectiveness of firewalls and detect unauthorized servers and backdoors. On Linux, it can be added from the add software item. A Windows port is available from the NMap home page.